Pattern Description: Misses' top with neckline variations and headband. 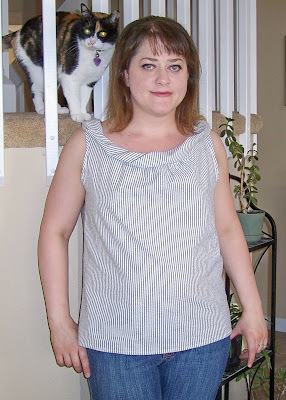 I made view A which has the twisted fabric at the neckline. Pattern Sizing: This pattern is available in sizes 6-22. I made a 16, one size smaller than my measurements recommend and it came out perfect. Did it look like the photo/drawing on the pattern envelope once you were done sewing with it? Yes, especially since I used almost the same print! What did you particularly like or dislike about the pattern? I like the twisted neckline. It is a unique feature that I haven't seen often. And it's not hard at all to do. Be sure you twist enough times though. The pattern has you twist the fabric four times and then sew in place. I only did four half turns at first which didn't have the right look. I undid it and twisted a full four times which came out right. 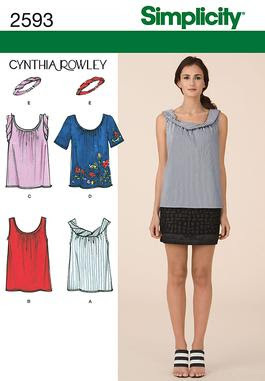 I really like how the Cynthia Rowley patterns have you do the armband and neckline binding. You sew the binding to the wrong side of the fabric, fold over, and top stitch from the front. The couple garments I have made with CR patterns have used this technique and the finished look is very professional. You have more control of catching in the fabric when using this technique. Fabric Used: I used a cotton seersucker from Fabric.com. This was very easy to work with. It's hard to see from the picture but it also has silver metallic threads running through the stripes which is a nice touch. The top cost me $9.50 for fabric. Pattern alterations or any design changes you made: I didn't change a thing. Would you sew it again? Would you recommend it to others? Yes, I will probably sew another view from this pattern. They are all really cute, basic shapes that can be done in a variety of prints and fabrics. I would recommend this one to others. It wasn't difficult at all- I think beginners would do fine with this. Conclusion: Great summer top. I can wear this with a pair of shorts and flip flops. Or with a skirt and cardigan over it for a dressier look. I love the neckline on your top. Looks great! So very cool! I love how your top turned out. Fabulous neckline indeed.